As soon as a user fills out your form and submits it back, you receive a notification email containing form entries. Get instant email alerts of the new leads, collected via forms will let you handle your customers more effectively and increase your conversion rate. You can easily identify your new leads, can have interaction with them and make sales. 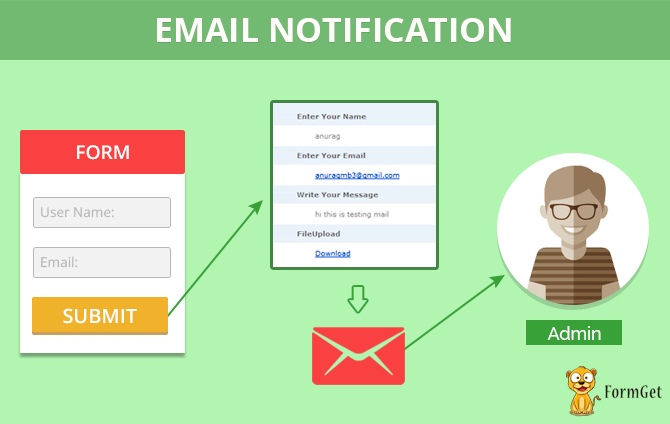 To activate the automatic email notifications feature in your form, you need to activate Email Notification Extension. Once you activate it, you can add multiple email ids in which you wish to receive emails after form submission. Enables email feature in the form. Email to a user when the message is submitted. Email to admin when the message is received. Email to a user when admin replies to his message. Email to a user when payment is sent. Email to admin when payment is received. As soon as the user submits the form, admin receives an instant email notification and user also gets an autoresponder message. Allows you to receive form’s entries directly into the email itself. You can add multiple emails to get notified via email notifier about all the form entries.